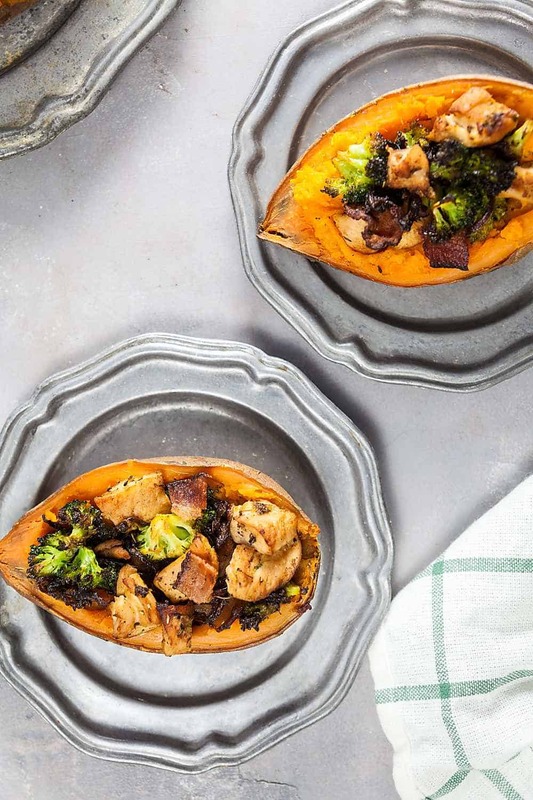 Chicken + Bacon Stuffed Sweet Potatoes (Paleo, Whole 30, Gluten Free) | Healthy. Delicious. 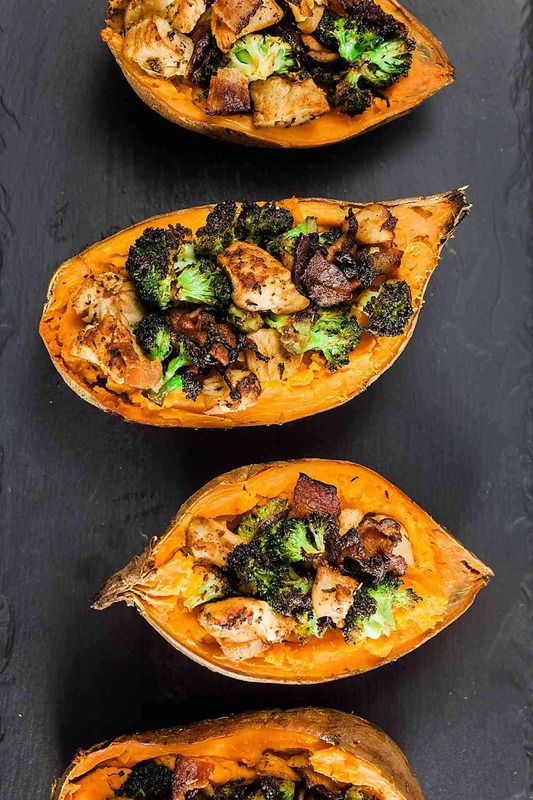 Paleo and Whole 30 stuffed sweet potatoes are filled with a flavorful combination of chicken, bacon, and broccoli for a flavor-packed dinner that’s super easy to make! This post was sponsored by North Country Smokehouse. Have you ever noticed that sometimes the best recipes are the ones you end up throwing together with random ingredients? 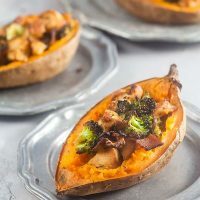 These paleo and whole 30 stuffed sweet potatoes came about when I was trying to clean out my fridge before we left town for a much-needed vacation. To my surprise, this stuffed sweet potato recipe was actually loaded with flavor. They were completely delicious and I couldn’t wait to eat the leftovers for lunch the next day. 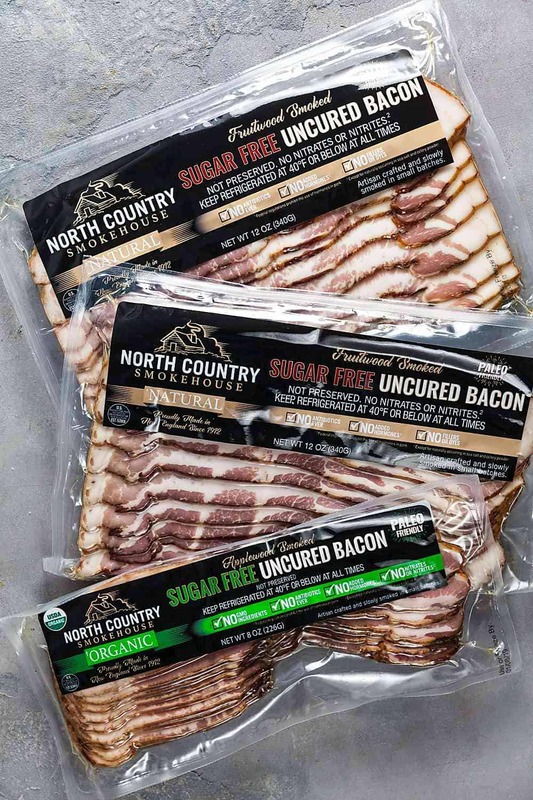 Paleo/Whole 30 complaint bacon can be tricky to find sometimes, but North Country Smokehouse recently launched a new line of sugar-free bacon that’s perfect for people doing Whole 30 or with a paleo or keto lifestyle. There are two products in the line – fruitwood smoked bacon and applewood smoked bacon – and they’re available at retailers like Hannaford, Whole Foods, Big Y, and Stop & Shop (find it near you with their store locator), which I’m really excited about. You can also buy it online! North Country Smokehouse is located in Claremont, New Hampshire and is one of the last few-remaining family owned smokehouses in the country. They smoke their bacon low and slow for over 10 hours, giving it a rich, smoky flavor. Just a few strips was enough to give thee sweet potatoes a ton of flavor. The bacon is made with 100% all-natural ingredients, no sugar, no antibiotics, no sodium nitrates or nitrites (which is why it isn’t as red as traditional bacon), no added growth hormones, and is certified humane raised and handled. The applewood version is also organic and is made from pork fed a vegetarian and non-GMO diet. I’m always starving when I get home from work, so baking potatoes in the oven on a weeknight is out of the question. I got a head start on these stuffed sweet potatoes by “baking” them in a slow cooker all day. It’s so easy, and they come out perfectly! 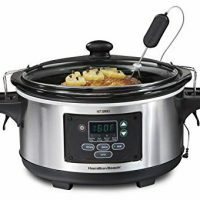 Just scrub the potatoes clean and poke them all over with a fork, then put them in your slow cooker. Cover and cook on low for 8-10 hours – they’ll be super soft and fluffy! The skins won’t be as crisp as potatoes baked in the oven, but it’s still delicious. And it will crisp up in recipes like this one that are finished in the oven. 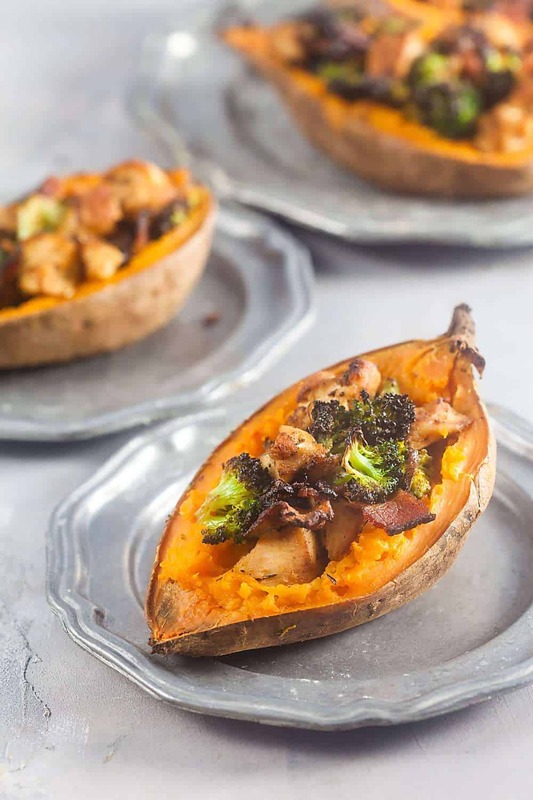 Paleo and Whole 30 stuffed sweet potatoes are filled with a flavorful combination of chicken, bacon, and broccoli for a flavor-packed dinner that's super easy to make! Scrub the sweet potatoes and poke them all over with the prongs of a fork. Place them in a slow cooker and cook on low 8-10 hours. Add the bacon to a cold skillet set over medium heat. Cook 8 minutes, until beginning to crisp. Remove the bacon from the pan and let drain on paper towels. Add the onion and broccoli to the skillet and cook 4-5 minutes, until they begin to soften. Add the chicken, paprika, rosemary, salt, and pepper; cook 5-6 minutes, to until cooked through. Cut the potatoes in half lengthwise and arrange on a greased baking sheet. Scoop out some of the flesh from each potato to form a shallow boat. Fill each potato with the chicken and broccoli mixture. Bake for 20 minutes, until the potato skins are crisp and the broccoli is lightly charred. Don't throw out the scooped out sweet potato - use it for sweet potato breakfast bowls!